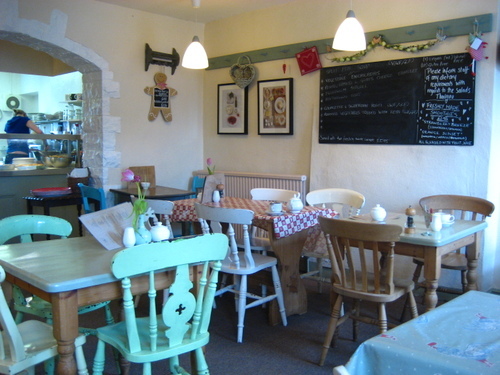 The town where we live has many cafes, tearooms and coffeeshops, its that kind of place. We have lived here for 4 months and so far I think we have been to half a dozen of them. I really enjoy the whole experience of visiting a nice cafe and settling down for a good cup of coffee and a bite of something delicious to eat. My favourite type of place has to be friendly, busy but not crowded, comfy, relaxed, nice to look at and deliciously fragrant. 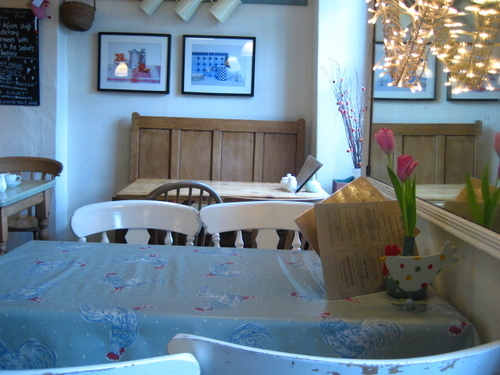 The cafe in these pictures is one of my favourites and one of the first I visited after we moved. Its only small, but oh so perfect! The coffee is delicious, the food equally so, but it's the beautiful details that make it special. There are tulips in spotty vase on the tables. Old, worn furniture, enamel jugs and fabric hearts (and you know how I feel about hearts right?). 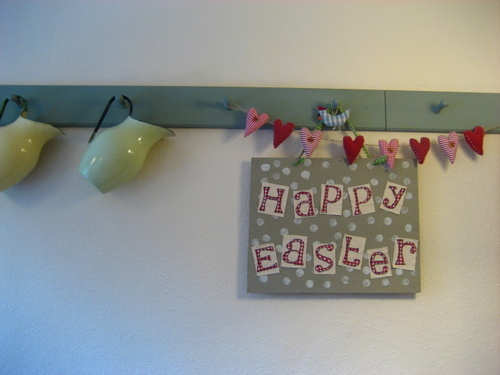 Textile pictures and knitted bunting with vintage buttons. 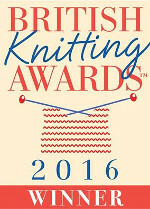 Every other Thursday the lovely lady who owns the cafe hosts a "Knit, Stitch and Natter" morning. When I was new to this town, I saw the poster in the window and thought how much I would like to join in, even though I technically don't knit, I figured crochet was close enough and i could certainly natter and talk yarn over a coffee. So one wet, cold Thursday morning in December I bundled my crochet Granny blanket into a carrier bag and nervously went along. I was made so welcome and enjoyed the most wonderful morning and now its something I very much look forward to twice a month. But this week being School Holidays there was no Knit, Stitch and Natter and I had two Little People to take care of. But let me tell you, my children like cafes as much as I do. They beg to be taken and jump up and down with excitement when I agree. So off we trot into town, just for the pleasure of being out and about and excited to be officially on a Cafe Outing for elevenses. We love that our favourite table by the window is free, the one which has old church pews with handmade cushions to sit on. 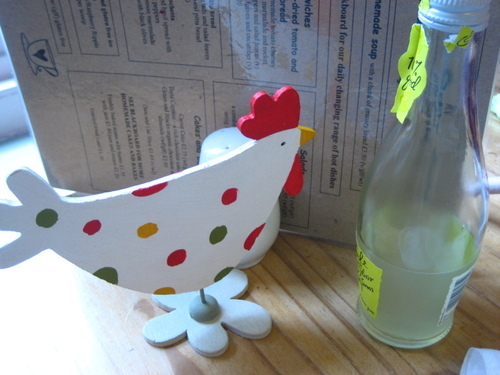 And for Easter a spotty chicken has arrived on the table too, and on the windowsill some Easter branches decorated with hand painted eggs and little fabric chicks. Cappuccino for me, organic lemonade for the Little People. Oh, and a date and oat slice as well to share. We munch and sip and slurp and have a good look around. Take it all in. Then the Little People get busy at the table while Mummy takes time over coffee. 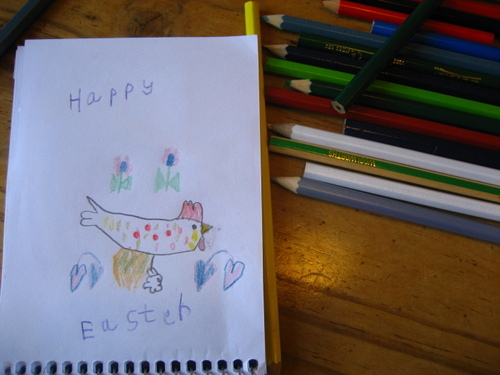 On one side of the table, out come coloured pencils and a small sketch book. And opposite, Polly Pocket dolls dance and chat. And I sip my coffee and enjoy watching my children do their thing. They delight me, truly. They are the best little cafe companions. I really love your blog entries - and would love to join you ;-) I love cafés, and I like the one you described. Our cafés are so different (at least in Salzburg, I would except this style of cafés in "student towns" [towns where there is more diversity in cultural life]). I love these kinds of places. It is so nice that your children enjoy them as well. Special memories you are making. Aren't you glad you joined in the knit group even though you are a crocheter? I am sure you will make wonderful friendships too. What a perfect trip to the coffee shop. When I read "natter" once again I'm a little girl, my Mum sais "pop in for a natter" all the time. I really love the idea of a coffee shop morning with lots of ladies doing their crafty things and chatting, I mean nattering way! What a wonderful tradition you've started with your kids. I'm sure that will be a fond memory for them of their childhood. And how great for you to have found such a cozy & friendly cafe. I would love to find a place like that around here- with knitting/crochet mornings too! Perfect! Now that's the sort of cafe I'd like to own, the owner has great taste and clearly knows what we want! Gorgeous pictures, and what a lovely way to pass time during the school holidays. I want to live in that cafe! Love the updates on your Easter hols , my kidlings dont break up until Friday !! The cafe looks great fun and sooo pretty too !!! I hope you dont mind me adding this bit but Vanessa of Just original and I are starting a blog for info , fun , northern craft gossip etc !! It would be great if you would join us ! !